John Davis is a Climate Analysts and former Dept Head, Restructuring the DoD at White House and Military Intelligence, NATO vid United States Navy. 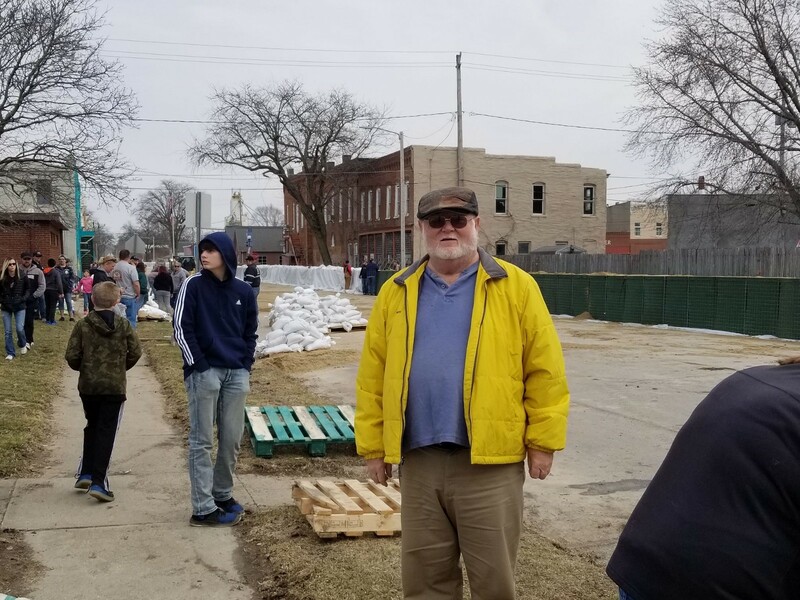 He is writing about his on-going experience of Nebraska worst flood in over 50 years. Well, here I am an eyewitness to what global warming can do and will do to our environment. I’ve been in the climate analyst area for a few decades now but this is the first time I’ve actually been face-to-face with the disasters it can cause. I was in the Philippines since November 2018 and arrived back home on March 7, 2019. I had snow drifts 12 feet high against my garages. The ground was solid ice and snow. Then suddenly something happened. It went from 14 F (-10°C) to 35 F (+1,7°C). Then the rains came and everything started to melt. 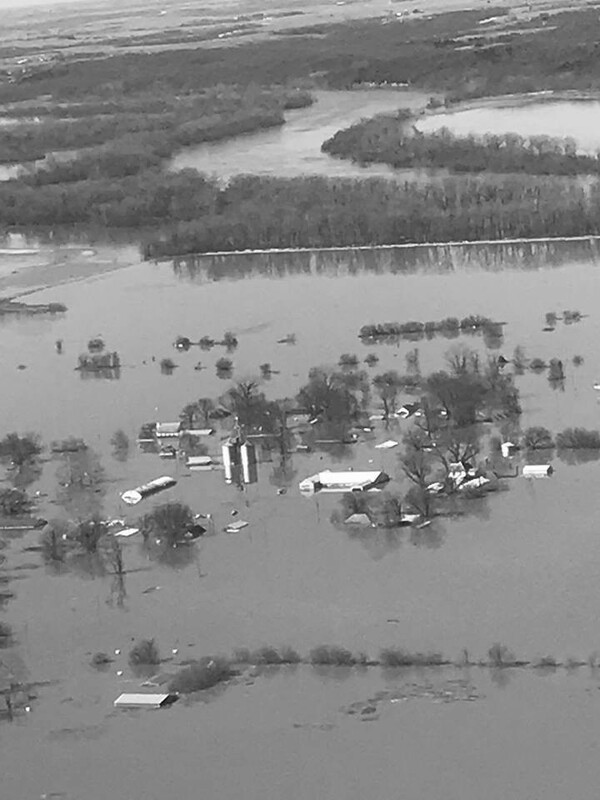 I know I posted the HuffPost article on what is happening in the Omaha, NE area with includes the Platte, Elkhorn, Big Blue, and Niobrara Rivers which drain into the Missouri River. The amount of snow and ice that was dropped along with the sub-arctic temps was more than the area should have gotten over 3 years. 18 feet of snow is normal and can be dealt with but 35 feet of snow and ice isn’t. All the rivers were locked in solid ice. The surrounding fields covered under tons of ice and snow. I live just south of Omaha, NE in a small town called Hamburg in Southwestern Iowa. My town is right between the Nishnabotna River system and the Missouri River. When it floods we are right in the middle of it. So on March 13, the temps went up and up and everything started to melt. Adding in the rain it made matters even worse. The Governor of Nebraska said this was the worst flood in over 50 years. I’ve kept records of winters here for about 9 years and have access to records going back to the early 1900s. This flood is at the level of the great 1952 flood when there weren’t levies here. The middle of the Midwest went from the breadbasket of the country to an area of water the size of Lake Huron, maybe larger. Here in Hamburg, I went out on March 15 to photograph the waters. They were high but containable. 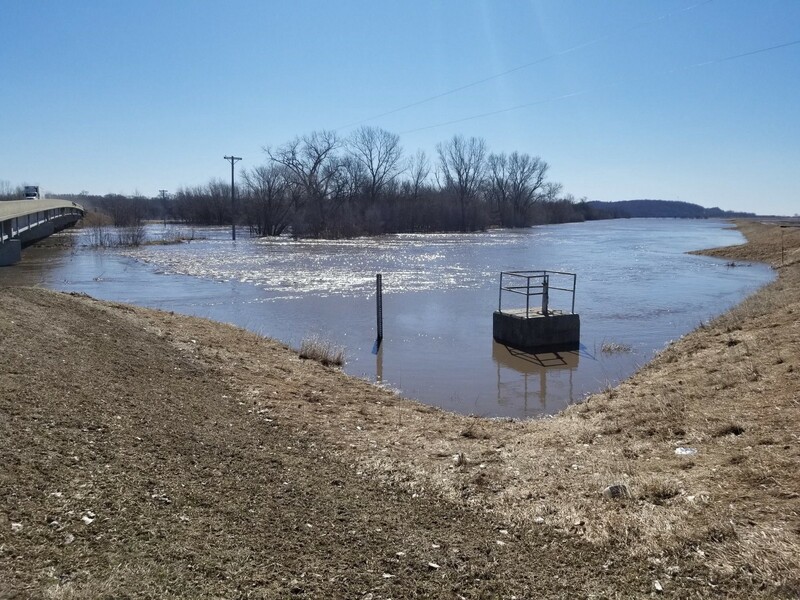 The eastern side of the Nishnabotna levy system was going under looking like waterfalls as the water rolled over the levy. Thousands of acres of farmland starting to become new lakes. The next day disaster! I went from Interstate 29, which is the main transportation north and south in the Midwest and went across Highway 2 to Nebraska City. Water was already starting to build up. There was a new levy system as the levies completed collapsed in 2011 due to age so everyone thought they’d hold. On the way back I stopped and looked at the levy and the water was 1 foot from going over. Now that levy is over 20 feet high. Needless to say, the water came. North on I-29 a portion of the levy broke cutting off all traffic. Then the levy at Highway 2 gave way. Then everything gave way. Al rods in the area were under water. There was only 1 country road out of my town but where do you go? 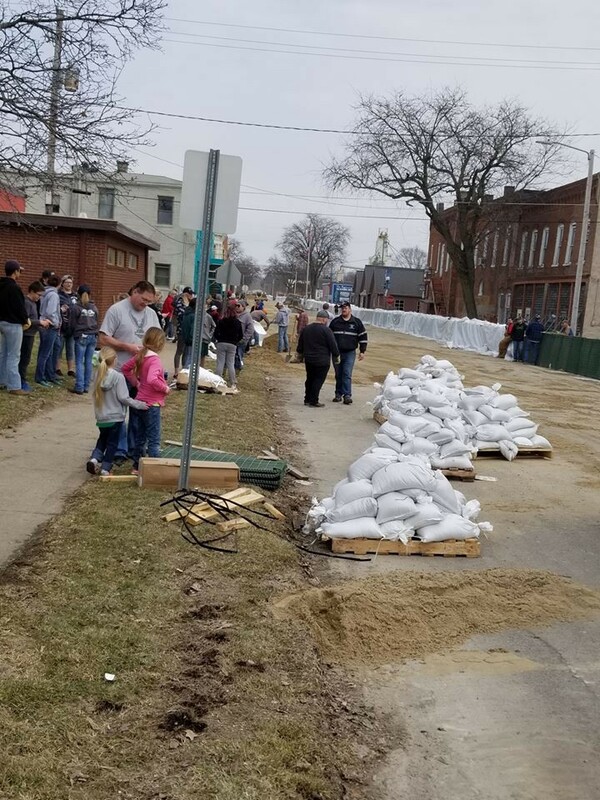 March 16 they start sandbagging the south end of the town as another part of the levy broke. But they had to stop as another portion of the levy broke and was going to cut them off. So new kinds of sand barriers were being put up cutting the town into. The lower, south end of town, was in the flood plain. No north not so much. And then the water came again and again. 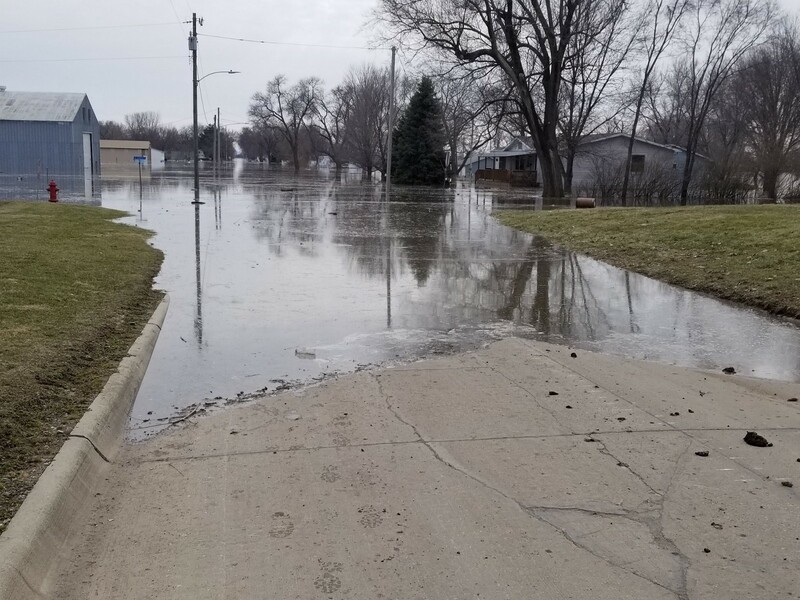 The entire south of town is now underwater as of 5:18 pm March 17, 2019. Eventually, the waters will recede but the real reason I’m writing this is that no one is talking about why this is happening. Sam Carara has posted many charts and graphs on the increase in air temps in the Arctic. I’ve posted many articles on this as well as others. This is one of the best examples of what adverse climate change can do to the weather. This is not going to be a rare occasion, this is going to be the norm. Besides events like this, we are facing severe hurricanes and typhoons the likes of which we’ve never seen. The Equatorial areas will be facing major droughts and famines, millions can die. For the rest of us, we’ll be seeing summers of increasing heat, drought, floods and crop failures. We’ve done this to ourselves. To date, the major polluting countries are doing nothing to correct his. Instead, they give platitudes and go on supporting the fossil fuel industry that created this. The IPCC said we have till 2030 to cut 50% of the carbon in the air before major disaster hits. Well, I think we’ve already past that. I’m seeing it with my own eyes today. I’ve posted some photos with this. If you find this helpful, please share this with everyone you know. Time for action is NOW! Mr. John David has a twenty-year military career behind him filled with awards for outstanding performance and numerous commendations and medals. John, a disabled Vietnam-era Veteran, retired in June 1988 and returned to Iowa. Upon retirement, he entered Tarkio College in Tarkio, MO. While pursuing a degree program in Political Science and History he specialized in International Relations and Public Policy. Mr. Davis, because of his long military career, was picked as the Team Leader for the United States National Performance Review Commission for National Defense. Heading this very important NPR Team, John was responsible for the restructuring of the Department of Defense, recommending policy direction for the President and Vice President. As well he presented formal and informal briefings to key personnel within the National Performance Review, Office of Management & Budget, Department of Defense, and the Office of the Vice President. He supervised and prepared budget recommendations regarding the Department of Defense for the NPR and the Vice President. With the end of the Commission in September 1993, John decided to retire from federal service and returned, again to the Midwest. Today Mr. Davis has gone from being an observer to a political activist on climate change. For the last 2 years, he has gone to the Philippines where he lectured and worked with the government, universities, and NGOs on climate issues for the Philippines.